St. Jerome was born at Stridon in Dalmatia around 347 A.D. He became a monk and embraced a life of asceticism. St. Jerome later became secretary to Pope Damasus. He is the author of the Latin Vulgate and is one of the four great doctors of the Latin Church. 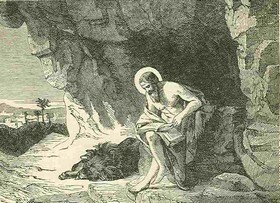 St. Jerome spent long years of his life in a little cave at Bethlehem, where Jesus had been born. There he prayed, studied the Bible, and taught many people how to serve God. 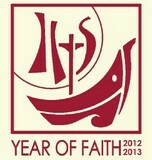 He wrote a great many letters and even books to defend the faith from heresy. St. Jerome had a bad temper, and his sharp tongue made him many enemies. Yet he was a very holy man who spent his life trying to serve Jesus in the best way he could. And so, despite his temper, he became a great saint. St. Jerome is the Patron Saint of Librarians, Scripture Scholars and Students. He died in 419 or 420. Sts Ambrose,Augustine, Jerome, and Pope Gregory Iwere the original Doctors of the Church and were named in 1298. They are known collectively as the Great Doctors of the Western Church.